If you want to run separate stations (or zones) on different days, you would use 2 different programs. Hunter controllers have multiple programs (A, B, and C) and the ability for each program to have multiple start times. To set up each program, you would need START TIMES, RUN TIMES, and WATER DAYS for each of them. You have a 4 Station Pro-C controller. Your lawn stations are valves #1 and #2. Your shrubs stations are valves #3 and #4. You want the lawn stations to water Monday, Wednesday, and Friday at 4:00am and again at 6:00am for 6 minutes per station. Then you want the shrub stations to water on Saturdays at 6:00am for 10 minutes per station. 1. Turn the dial to the START TIMES position. Look for the capital “A” near the start time number. If the display shows another letter, press the “PRG” button until the “A” appears on the display. Press the RIGHT ARROW button until the display shows “1-A”. Press the “+” button to set the start time to 4:00am. Press the RIGHT ARROW to advance to start time 2. Press the “+” button to set start time 2 to 6:00am. Make sure start times 3 and 4 in Program A are set to “OFF”. The OFF position is between 11:45pm and 12:00am. 2. Turn the dial to RUN TIMES. Press the “+” or “-“ button to change station 1 to 6-minute run time (0:06). Press the RIGHT ARROW button to station 2 and set for 6-minute run time (0:06). Make sure stations 3 and 4 are set for zero run time (0:00). 3. Turn the dial to the WATER DAYS position. The symbol above “MO” should be flashing. (If you see the “MO” flashing, press the right arrow 9 times until you see the symbol above “MO” flashing) Press the “+” to set Monday as a water day. Press the “-“ button when the symbol is flashing above TU, TU will show as a no water day (drop with a circle). Press the “+” to set Wednesday as a water day, press the “-“ button to set Thursday as a no water day, press the “+” to set Friday as a water day, press the “-“ button to set Saturday as a no water day, press the “-“ button to set Sunday as a no water day. The symbol will go back to flash above Monday. Program A is now set. 1. Turn the dial to the START TIMES position. Press the “PRG” button. Look for the lower case “b” near the start time number. Press the RIGHT ARROW button until the display shows “1-b”. Press the “+” button to select the program start time (set start time 1 to 6:00am). Press the RIGHT ARROW to advance to start time 2. Make sure Start Times 2, 3 and 4 in Program B are set to “OFF”. The OFF position is between 11:45pm and 12:00am. 2. Turn the dial to RUN TIMES. Make sure stations 1 and 2 in Program B are set for zero run time (0:00). Press the RIGHT ARROW button to station 3. Press the “+” or “-“ button to set station 3 to 10-minute run time (0:10). Press the RIGHT ARROW button to advance to station 4 and set to 10-minute run time (0:10). 3. Turn the dial to the WATER DAYS position. The symbol above “MO” should be flashing. (If you see the “MO” flashing, press the right arrow 9 times until you see the symbol above “MO” flashing) Press the “-“ button when the symbol is flashing above MO, TU, WE, TH, FR. Press the “+” to set Saturday as a water day, press the “-“ button to set Sunday as a no water day, The symbol will go back to flash above Monday. Program B is now set. Set All Start Times in Program C to “OFF”. The OFF position is between 11:45pm and 12:00am. Programming a controller is easy. You just need to program the current day and time and you are ready to create a program for your zones or stations. It only takes three ingredients to complete a program: a start time, run times, and days to water. 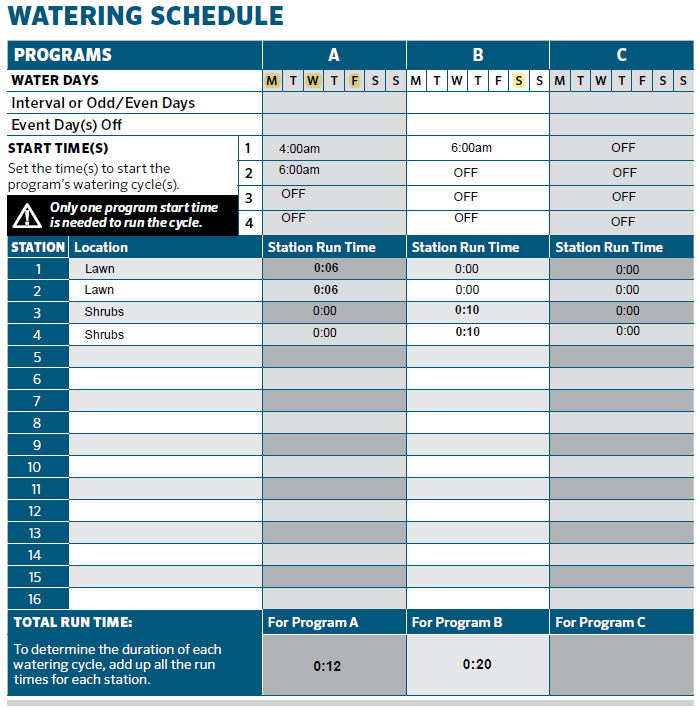 A program is a group of stations that share the same schedule: same days to water and same number of times per watering day. You only need one program (Program A) if you want all your zones to water on the same days and in a sequential order. If some of your plants or lawn areas have different watering needs, they will need to be put in a separate program (Program B and/or C).